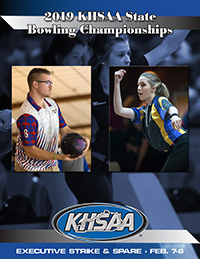 The roster by school for the 2019 KHSAA State Bowling Tournament, with the exception of Region 7, is now available for review on the KHSAA website. The roster listing includes unified & adapted participants and can be found through the links below. Each school should review its student-athletes and let us know immediately of any necessary changes (i.e. misspelling of names, incorrect grade, etc.) by emailing us at bwresults@khsaa.org. It is important that you send corrections to bwresults@khsaa.org to ensure all parties are aware of the changes. The deadline for these changes is 12:00 p.m. ET on Monday, February 4th. Coaches and participants should review all materials on the KHSAA website under the State Information and Instructions tab, which includes links to the state instructions, time schedule, oil patterns, hotel information and much more for the 2019 KHSAA State Bowling Championships. Lane assignments will be posted as soon as they are complete.